Determining the importance of boat travel in the plan to effectively and sustainably exploit Halong bay, Quang Ninh inland waterway Port Authority has implemented reorganization of cruise ships providing sightseeing and accommodation in Halong bay. According to the plan, owners of the cruises operating on the bay will register with the Port Authority on the day before departure. The cruisers serving walk-in visitors will be arranged to dock in turn and board according to the number of passenger tickets. After a month of implementation, this plan has basically solved the problem of overcharging and scrambling tourists wishing to rent a boat to visit the vay, ensuring the departure time in good order, not letting the disorder situation at the port area, at the same time help the authorites better manage activities of tourists, contribute to improving the business environment in the area, improve traffic safety, creating positive images for travelers to visit Halong bay. Tran Manh Tuan, a visitor from Hanoi said: "I have been to Halong a couple of times, however this time the arrangement is much better, more convenient and effective, I bought tickets at the whaft and was given proper information to get on board, especially I didn't have to avoid touts from middle men, they seem to have disappeared"
Speaking about the rearrangement of Halong cruises of Quang Ninh Waterway Port Authority, Mr Vinh of Toan Thang cruise ships said "Being a business owner operating in Halong bay I find this solution very good, our crew members no longer have to hunt customers like before because there is a specific calendar with times and order" However, in the process of implementing the initial plan was that there are problems such as the subscription period on the afternoon of the day before the tours start which is very difficult for ships to serve tourists. However we have got used to it after a month. 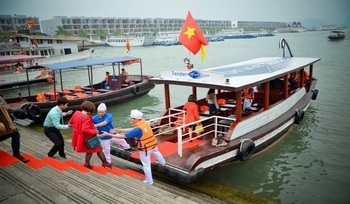 Reportedly, Quang Ninh authorits have developed many training sessions before putting the new plan into operation, informing cruise owners about rights and duties to perform and thus clearly defined functions and responsibilities of the agencies and units involved in the organization of registration, performing pick up or drop off passengers, sale of passenger tickets at the port. Also, listen to the opinions and wishes of the ship owners to come to the agreement, give timely adjustments, ensuring better serve tourists to Halong Bay.